With over 3,000 islands and a wide-swath of coastline included in the prefecture there are many beautiful beaches to enjoy swimming. 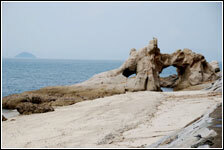 Popular JET haunts are Futami Beach in Iyo, Kashima Beach in Hojo, Marine Park in Niihama, and various other beaches along the Shimanami Kaido in Imabari. Being a more backwater, inaka prefeture has its advantages. Namely there are endless places of pure, undisturbed nature to hike through. Popular hiking destinations are (though certainly not limited to!) 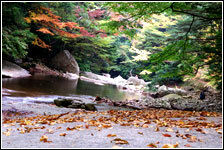 Nametoko Gorge in Matsuno and Mt. Ishizuchi in Saijo. Everyone knows that Ainan is a very inaka place. 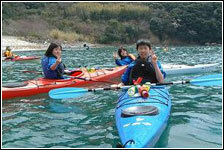 But what most people don’t know is it is also one of the few places you can go kayaking! Believe it or not you can actually go skiing in Ehime! The mountains that seperate Ehime from Kochi are powdered in snow every winter. 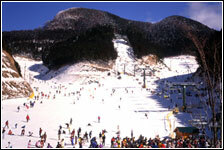 The two major ski spots are Kuma Ski Land in Kumakogen and the ski area in Oda, near Uchiko. Do you like running? Then you should try a marathon. 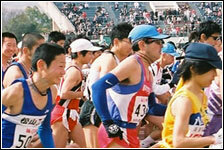 Held annually at the beginning of February, the Ehime Marathon is held in Matsuyama City and has been completed by Ehime JETs in the past! For more information, visit the Japanese website here. Entry is done by lottery (it`s very popular) and you can register from the end of July. Marathon not enough for you? Never fear, Ehime is also home to one of Japan’s major triathlons, the Nakajima Triathlon held annually at the end of August on the island of Nakajima. 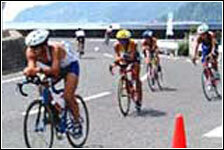 The Nakajima Triathlon attracts athletes from all over Japan, and entry is by lottery. It is also one of the most beautiful courses that take you all around the island. Information is only in Japanese, but have a look here. 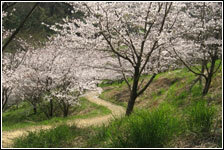 Sakura in Ehime blooms around end of March – early April and stays in full bloom for only around two weeks. During that time, the entire Japanese population will find a good sakura spot, spread a blue tarp on the ground, and have a good day of BBQ and sake. Hanami parties are great times to get to know your neighbours, students or your co-workers!